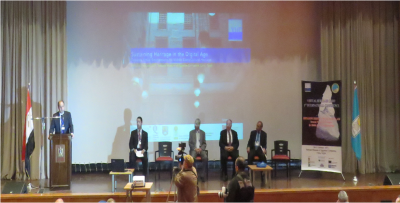 New Frontier for digital Preservation of Heritage in the Middle east was held at the National Museums of Egyptian Civilization, the best place to host us. The National Research Institute for Astronomy and Geophysics and its President: Professor Hatem Odah and Project Lead: Professor Gad El-Gady, the President of the National Institute of Oceanography and Fishery, organized & managed the project activities in Egypt and the generous hosting of VHC Colloquium and training workshops in Egypt. 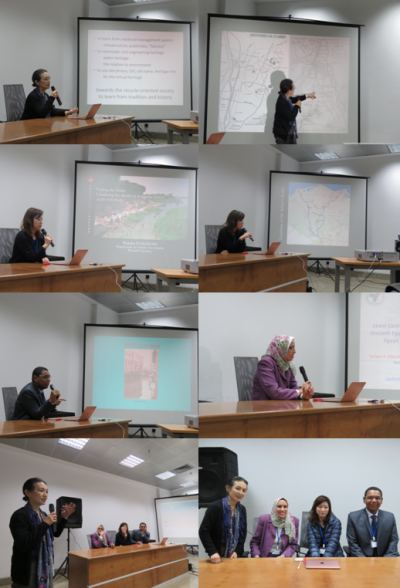 The director of JSPS Cairo Research Station, Dr. Fukami provided the session of “Visualization the Time and Space Surrounding Water; Connecting Water Heritage to Historical Network and Space under the Muslim Rulers in Medieval Time”. This station attempts to visualize histories and heritage especially related to water, such as banks, waterways, wells, bridges, ports and etc.. To construct the facilities of water management was almost large scale civil engineering works so it requires long term and great care, therefore it means the duties and responsibilities of Muslim rulers to manage the territory in medieval time. Until the Modern times, water facilities also were connected the route deeply, through which humans, materials and information were moved. We will challenge to begin from heritage as the points, to broaden to the historical waterways and tracks as the linear, more to expand to the villages and cities, to territory.